Joe Wilson Exposes Democrat-Driven Healthcare Process in "Teachable Moment"
The issue is one of several thorny problems that came up as a small group of negotiators on the Senate Finance Committee met Friday morning. Finance Chairman Max Baucus, D-Mont., is aiming to finalize legislation on Obama's health overhaul by next week — though whether it's bipartisan or not remains to be seen. 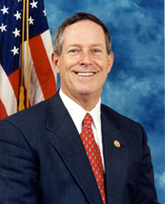 Members of the group said they thought they'd settled the question of illegal immigration, but it came to the fore this week when Republican Rep. Joe Wilson shouted "You lie" at Obama during his speech Wednesday. Obama had said illegal immigrants wouldn't be covered under his health plan. Senators said that's forced the committee to work on provisions verifying legal status before an individual can get coverage. The negotiators put off extensive discussion of the illegal immigration issue until Monday and said aides would be working on language on that and abortion over the weekend. When would these issues ever have been discussed if Joe Wilson hadn't cried out to create the "teachable moment" during Wednesday night's presidential address? Pointing out only to H.R. 3200's section 246 -- which groups such as Factcheck.org have done -- is a bit misleading. This brings us back to Obama's speech last night. It's true that the Democrats haven't explicitly called for illegal immigrants to be covered by H.R. 3200, but by voting down two amendments that would have verified participants' legal status, they seem to have implicitly allowed it. It's no crime in Washington to say one thing and do another, especially when you're under pressure from influential special interest groups, but it should still be a bit embarrassing for politicians discovered to be doing it. So while Joe Wilson may not have chosen the best way to express it, he did have a point. As the president might have said, the Republican politico's outburst has turned into one of those teachable moments.